My birthday is getting closer and closer and I've been thinking for quite some time about the things I'd like to get (possibly because I'm that shallow), so I thought I might as well share my cravings with you :) My 23rd birthday is on the 7th of September, 2 days after the wedding. I'm sure there'll be enough alcohol left after the big day to celebrate it too! It all started with me wanting badly Benefit's Creaseless Cream eyeshadow in Skinny Jeans. This product is available in Poland, but when I saw its whopping price in Sephora, I decided I'd rather ask my fiance to pick that up for me, there's a Shopper's Drugmart with a Benefit counter about 3 minutes walk from our apartment so he can make that sacrifice... Then I thought I might as well ask him for some bits and bobs from Lush since they're unavailable in Poland, maybe a solid perfume I could carry with me... I'd also love some new stud earrings, these rose shaped ones are really adorable and elegant; I'm saving this wish for my mum, I know she'll pick something beautiful. To finish off, I'm really enjoying wide waist belts at the moment, and I think this plum shade is perfect for autumn. And, lastly, speaking of autumn, a nice square scarf would be ideal for chilly days. Congrats on your wedding, I did not know you were getting married!! 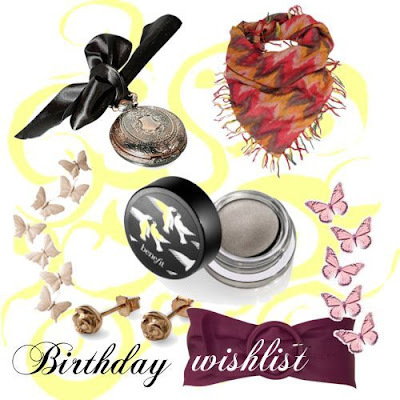 Loving your birthday list, hope all of your birthday dreams come true!! love this list btw, Skinny Jeans is amazing and so is Birthday Suit! !